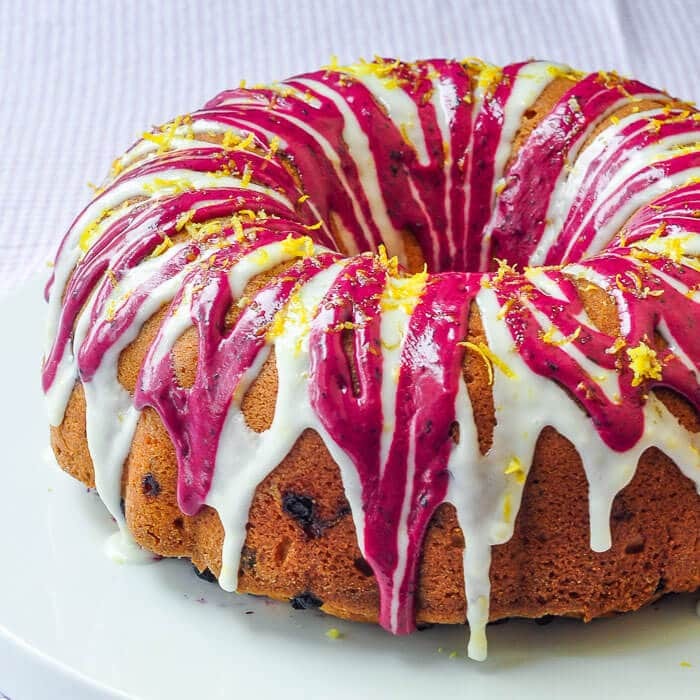 Lemon Blueberry Pound Cake - cream cheese batter makes it so moist! 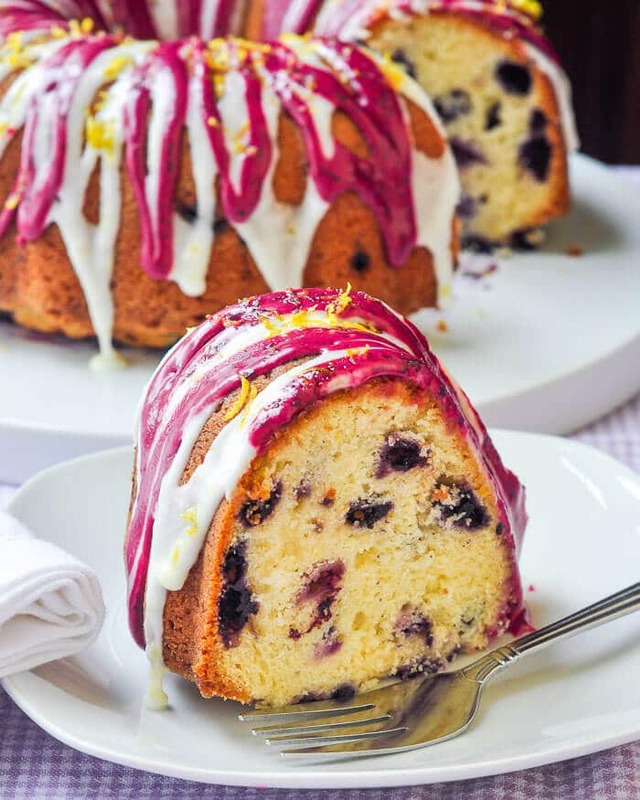 The cream cheese batter is what makes this lemon blueberry pound cake so special. It gives added richness, flavour & moisture to this delicious glazed cake. Yes, I do tend to obsess sometimes on my favourite flavour combinations but with wild blueberries now in season on these shores, it’s hard for me not to think about incorporating them into as many desserts as I can while they can still be enjoyed fresh. Here I’ve taken one of my favourite pound cake recipes and adapted it to include a mellow lemon flavour and to hold lots of fresh blueberries. This is the kind of cake that I always count on as being ideal for a Sunday. 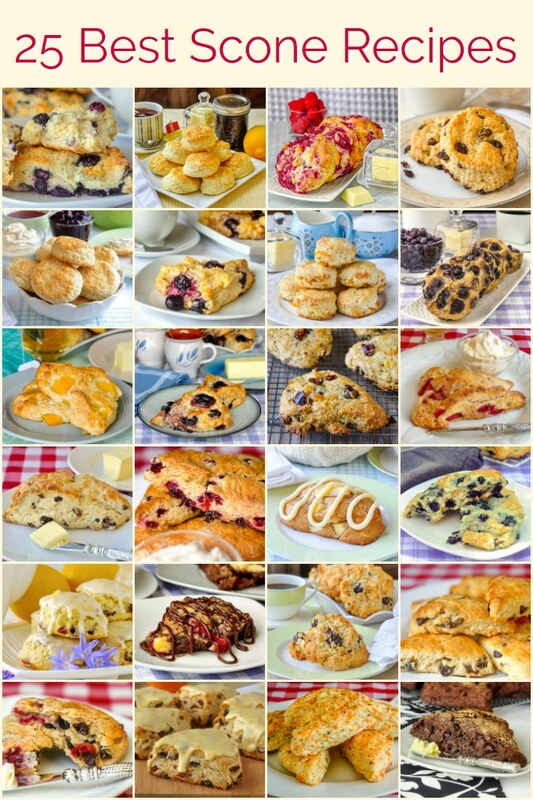 I like to serve it for a brunch dessert if we have people over and the rest is perfect for dessert at Sunday dinner. I’ve added two glazes here to pretty it up a little but you could easily use one or the other or none at all if you prefer. This moist, delicious pound cake needs only a simple sprinkle of powdered sugar to make more than an acceptable presentation. This one was very well received when I took it along to a friend’s house after the annual Royal St. John’s Regatta last night. Like this Lemon Blueberry Pound Cake recipe? Lemon Blueberry Pound Cake - The cream cheese batter is what makes this lemon blueberry pound cake so special. It gives added richness, flavour & moisture to this delicious glazed cake. Preheat oven to 350 degrees F. Grease a bundt pan very well and lightly dust with flour. The cake can also be baked in 2 loaf pans or in a 9 inch springform pan if you prefer, just adjust the baking time accordingly. Cream together the sugar, cream cheese, butter and vanilla well. Add the eggs one at a time, beating well after each addition. Then add the lemon zest. Gently fold dry ingredients into the creamed mixture until the flour is almost fully incorporated. At that point fold in the blueberries. Bake for about 1 hour or until toothpick inserted in center comes out clean. Baking times will vary considerably, especially if you are using frozen berries, which can add as much as 15-20 minutes. Watch it closely and rely on the toothpick test to make sure that it is completely baked. Cool on a wire rack for 15 minutes before turning out of the pan onto the rack to cool completely. Drizzle witht he glazes before serving. Whisk together the icing sugar and lemon juice (or blueberry puree) until smooth. 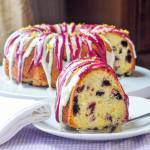 Use only enough lemon juice or blueberry puree to bring the glaze to a thick but still pourable consistency. Start with a tablespoonful and then add a teaspoon or so at a time until the proper consistency is achieved. If it gets too thin just add a little more powdered sugar to thicken it back up. Place the glazes in separate Ziploc bags and snip a little off the corner of the bag to make a small hole. Use the filled bag to then drizzle the glaze over the cake. The lemon glaze should be used first for best appearance. Sprinkle with lemon zest before serving if you like. Zest should be ok. More juice would likely make too wet a batter. Ok, so i see there is lemon zest but is that the only lemon for the hole cake? and if so it wouldn’t have to be a lemon cake at all since there isn’t actually any lemon in the cake itself. right? Lemon zest has far more lemon flavor than juice, so it’s definitely lemony. This recipe was sooooo good. It was my first attempt at a bundt cake using my sister’s (very detailed) house shaped bundt pan, and it was amazing. I baked it and served it for dessert last night, and it was very quickly demolished, and pieces taken home in doggy bags. The ratios of ingredients were just right – it rose beautifully, it tasted fresh and lemony and had a good amount of fruit. I found that the blueberries tried to sink to the bottom (/top), but that could be because they were quite large blueberries. We only did the lemon glaze on it as we had no spare blueberries, and it was just perfect. I might experiment with using buttermilk or greek yoghurt instead of cream cheese in the batter to see how it changes the flavour, but I have no complaints! Hi, can this recipe be put in a loaf pan instead of a bunts pan ?